The Mister and I have been trying to plan a big adventure vacation for a long while now. We were flirting with barging in France (who wouldn’t?) but I got put off by how much of our vacation savings would just go toward airfare. 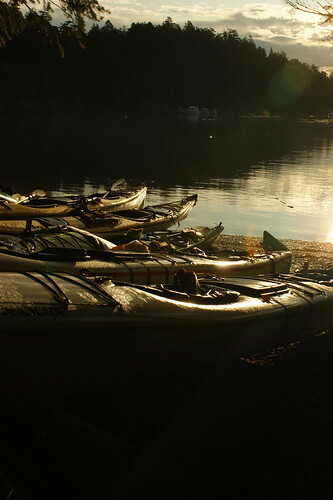 The other thing I’ve had on my mind for years is kayaking in the San Juan Islands. So we took a couple lessens here in Portland from the Portland Kayak Company, one out on the Willamette River just toodling around and learning how to paddle and one in a pool learning to get ourselves back in our boats should we flip them over. Handy trick, no? 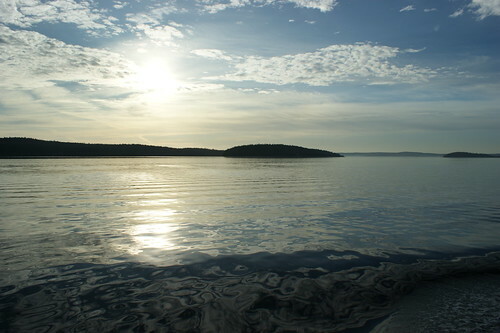 We booked a guided weekend tour with Outdoor Odysseys on San Juan Island and had a great time. Our guide, Kaitlin, was totally wonderful and the other couple on our trip happened to be Portlanders and also winemakers! We loved chatting with them about outdoor adventures and the making of beer, wine & cheese. We paddled out from San Juan State Park and across the channel to Stuart Island which was our base camp where we slept in tents and paddled during the day. Total, we paddled over 30 miles on the 3-day trip and it was tiring but amazing. We saw harbor seals, porpoises, stellar sea lions, jellyfish and lots of kelp. The coastline of the islands is gorgeous and the weather was great. So… kayaking, blah, blah, blah. This is a cheese blog! To make a short story long, it’s a good thing we did all that kayaking because we were then more than happy (and hungry) to partake in the local cheese scene! Before we got out to the islands we headed straight up to Vancouver, BC, to visit friends and see the city. Neither of us had ever been to Vancouver before and other than a stopover on a flight to Europe, I don’t think I’ve ever even been to Canada. That seems really weird given that I’ve lived in the Northwest now for over 10 years. We had a great time in Vancouver — it’s a warm, welcoming city and very similar to Portland in a lot of ways. The vibe is very casual but it was nice to hear more languages and see a little more diversity than we have down here. First thing, we made a beeline for Les Amis du Fromage which is near Granville Island to pick up some BC cheeses. I had my trusty red cooler with some ice from the hotel. 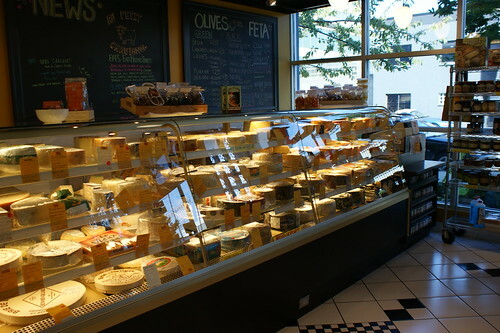 We let the ladies there guide our choices and ended up with a really nice array of cheeses from around the area. Goat is pretty prevalent but there was quite a variety. We ended up with two firm, aged cheeses and two softer cheeses. 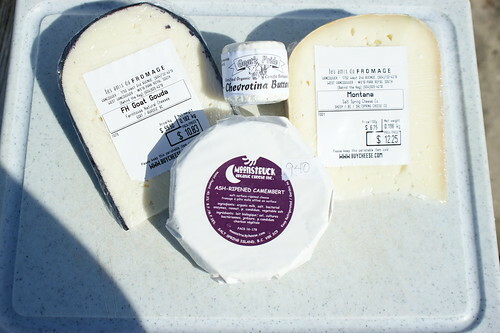 Clockwise from left, an aged Goat gouda from Farm House Natural Cheeses, a chevre button from Goats Pride Dairy, an aged sheeps’ cheese called Montana from Salt Spring Island Cheese Co., and Moonstruck, an ash-ripened Camembert from Salt Spring Organic Cheese. Thom loved the goat gouda which had a well-balanced flavor. The sheep was also very good, a bit stronger than the others but really quite nice. The button was delicious! The standout, though, was that Moonstruck camembert. Oh my. It was so fantastic, it was hard not to eat it all in one sitting. We held off, though, and were able to enjoy these for another picnic once we got to Orcas Island. After some excellent sushi, drinks with friends, biking the seawall at Stanley Park, a visit to Chinatown, a thrilling step into an actual Fluevog store and a killer meal at Vij’s, we left Vancouver and headed to the San Juan Islands. We spent three nights camping at Moran State Park on Orcas at the edge of Cascade lake which was just so pretty. The park was fantastic and has plumbing and showers which makes all the difference. I highly recommend! Then we headed off to San Juan for our kayaking adventure. And for that camping, we roughed it a bit — no showers. Which, for three days is entirely do-able. However, I was so happy to get back to the island, check in to a hotel and wash off the salt water and be like the starfish on a fluffy, king-size bed. Heaven. After a good night’s sleep we went hunting for more cheese. Now, I knew, because of Tami Parr’s excellent book, that there was a cheesemaker on San Juan but she seems pretty elusive even to locals. I would occasionally ask people if there were any cheesemakers on the island and no one knew of any. Of course, I was secretly hoping someone would say, “oh, yes, my best friend on the island makes cheese — join us for cheese and wine tonight!” Sadly, that did not happen. I tried to call her but only got voicemail with instructions that she would only return local calls. 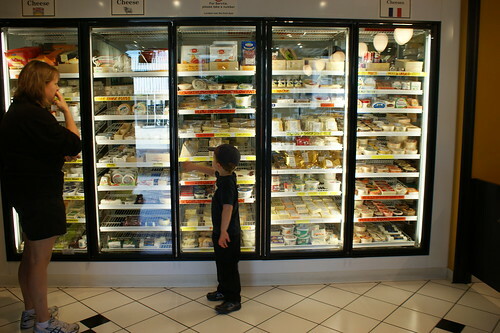 But, luckily, the Friday Harbor grocery, King’s Market, had her cheese! Quail Croft farmstead cheeses are made on San Juan island from surely the happiest goats in all the land. That area is just so beautiful. I bought two of Quail Croft’s chevre, one plain and one herbed — both were excellent, creamy and slightly tangy but very light and lovely. We also picked up some Samish Bay (Bow, Washington) nettle gouda and a puck of my beloved Mt. Townsend Seastack. The Samish Bay gouda was quite tasty though I’m not sure nettle is my favorite flavor. If you didn’t know it was nettle you might think to yourself, “just what IS this slightly bitter herb?” The Seastack was just as lovely as I remembered and the Westcott Bay (home of delectable little San Juan oysters) dry cider was a sweet accompaniment. We had such a lovely vacation and it was such a treat to find so many local goods of such high quality. There was a brewery on the island who got most of their hops from a farm right there. The Westcott Bay oysters are, I understand, mostly harvested to feed the local economy of oyster lovers and no longer shipped around the world. It seems that Quail Croft does enough business supplying the fine-dining on the island and putting cheese in the markets to sustain themselves and the product is fantastic. It was an interesting trip into a micro-economy which mostly subsists on tourism and the products of neighborly efforts. There’s something really alluring about that lifestyle. I can’t wait to go back!